Driving by the lake today, I saw the most glorious sunset above the water. Someday, we will see Jesus face to face. The radiance of His presence will be known by those who are redeemed. You’re at work. A colleague walks up to you and asks, "Where is the new employee we hired last week?" You answer in a polite tone, "Right over there. The one getting out of that nice, new blue car." There’s nothing wrong with the dialogue here. Nothing inappropriate has been spoken. you had been keeping disappointment about some things to yourself; you felt that you should have a better paying position. One that could afford YOU having better transportation. Although the words you spoke may have sounded kind enough, inside the hurt and disappointment fueled the words, "….the nice, new blue car." Today, I said something that immediately fell into this category. No one could ever have thought that what I said was displeasing to God or anyone else. Yet, I knew that a comment that came from my mouth surfaced because of my own personal disappointment in someone else. God was letting me see this discontent and showing me the ugliness of the words as they were truly birthed. I would have hoped that these feelings would not have become hurtful barbs formed from my words. So what should I do? The area I live in is prone to dampness and mold. So many times I have taken to the windows with paper towels and bleach. 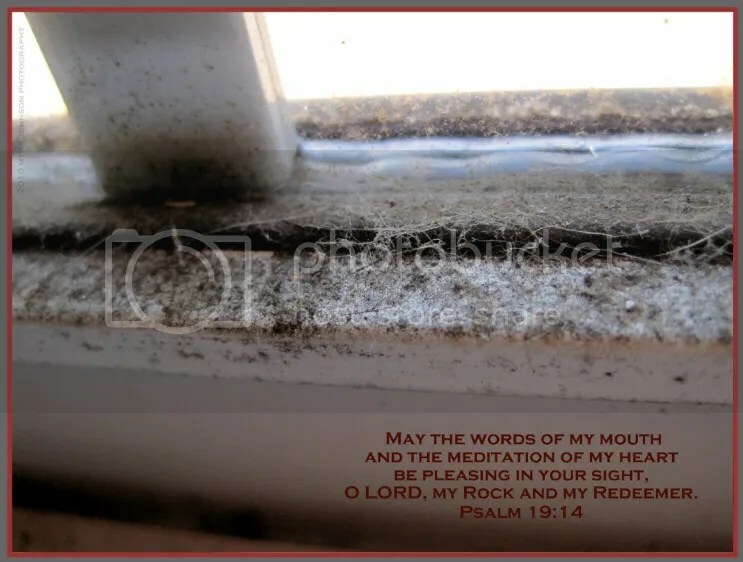 When the windows become black and moldy, they become home to web spinning spiders, doubling their disgusting appearance and adding an element of danger. There is a window in our son’s room that is neglected. Behind blinds, it is never opened and rarely cleaned. On occasion, there will be reason to lift the blinds. When this occurs, the filthiness allowed to collect there is exposed. My reaction is one of disgust. I want a clean, mold- free window. If this is to be, the paper towels and bleach will have to come to the rescue. If it is to remain clean, the paper towels will have to make periodic visits on a consistent basis. My son’s window and I? We are very much the same. Left alone to collect dust, spider webs and mold, disappointments had grown freely. When the blinds were suddenly pulled away, the hurt that had not been taken to God in prayer was fully exposed. My reaction was like finding black mold on a window sill. I know what God wants to do. He wants to heal those areas in my heart that are prone to neglect. He is ready to forgive my wrong attitudes. He wants the words of my mouth to be pleasing, coming from a heart that is pleasing to Him, as well. He knows what’s behind the blinds….. It is such a happy, joyful sounding song. A song that feels light hearted, yet filled with such immense truth. It is an uplifting song that makes my heart want to shout, "Yes!" Perhaps that’s what it means in the Bible when there is a reference to, "Yes and amen." My spirit connects with this song in a way that I can’t desribe. 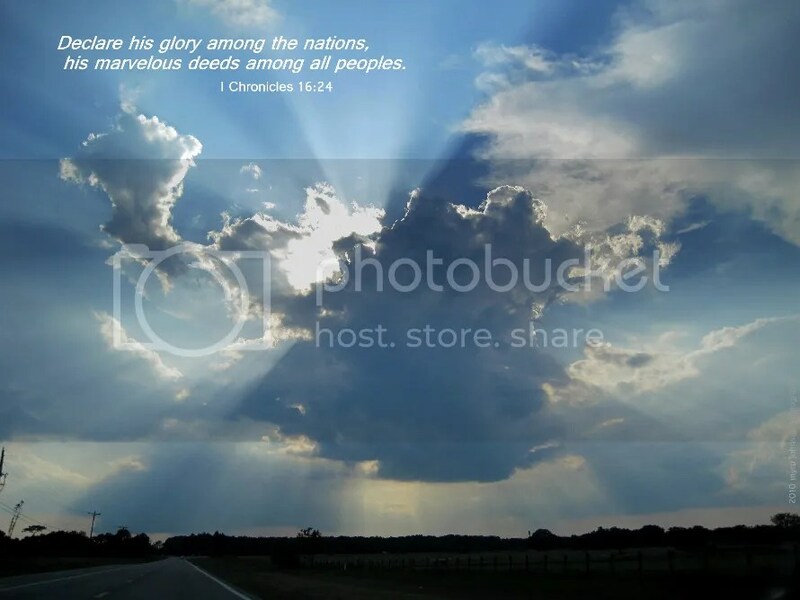 "Our God," by Chris Tomlin. Our God IS greater, our God IS stronger. He IS healer and He IS awesome and powerful! He IS for us, so there is NONE to stand against us. Some very kind friends surprised me with an offer for dinner out last night. The food was good and the service was friendly and cordial. As we began to talk and "catch up" a bit on each other’s lives, I told them of a recent prayer I had voiced while on the way to work one day. It seemed like I had not been at work five minutes until my prayer had been answered. The telling of God’s goodness—His love and compassion—to those we spend time with allows them to share in the knowledge of who He is and what He is doing. Our personal testimonies that stem from our relationship with Him cannot be refuted. They are ours to share. What blessing of God in your own life would bring joy to someone’s heart today? When I was a child, I lived just a few houses from a railroad track. Beside the track was a ditch. If the ditch was filled with water, tadpoles could be seen swimming happily in the murk. It would be an exciting time to get some sort of pickle or mayonaise jar and "catch" the tadpoles and bring them home to watch. Now, instead of living near a ditch, I live very close to several bodies of water.Taking advantage of that fact, my husband and I went on a boat ride. It was a perfect day. The sun was out, yet the breeze was cool. Dolphins were surfacing to breathe, making graceful arcs as they pierced the surface of the water to emerge for an instant into the air. Each time I would try to photograph them, I seemed to only catch a fin. Wildlife is fascinating to me. I greatly enjoy seeing what God has created. When I was a child, scooping up a few ounces of water in a ditch was an easy thing to do. 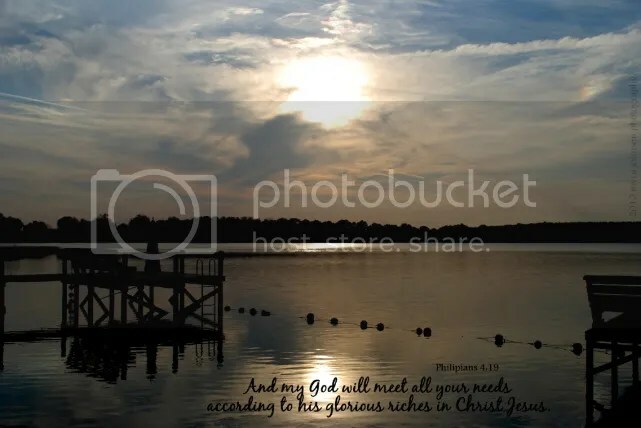 The Bible tells us in Psalm 33:7 that, "He gathers the waters of the sea into jars; He puts the deep into storehouses." Doesn’t that sound easy? Just put the waters of the deep into jars. Just like that. Dolphins and all. I believe it is easy for God. He created the earth. Is He not the Master of it? If He could place the sea, with all the creatures great and small within "jars" of His making, what could possibly be too hard for Him? Do you think that animals communitcate with God? During the time of the flood, God called the animals to the ark. In the Old Testament, we find the story of how God opened the mouth of a donkey and let it speak to it’s owner. 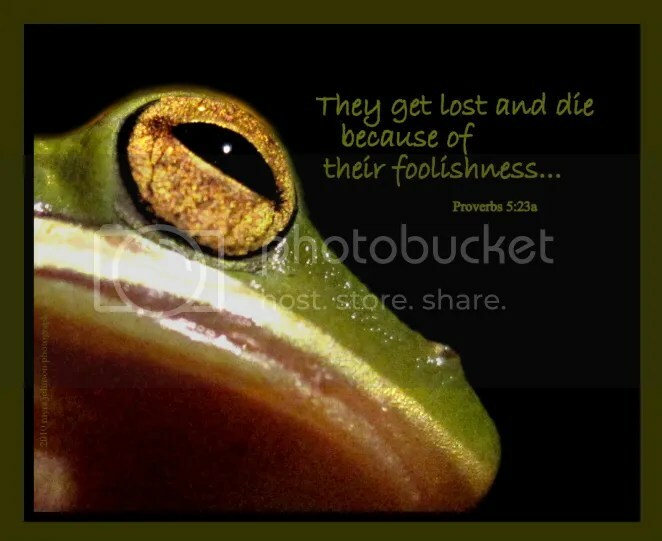 In Isaiah, God tells us that "the wild animals honor me…"
Wouldn’t you like to know what they think about their Creator? In Heaven, someday, we may know. For now, the thought of animals and their communication with God brings a smile to my heart. What exactly was he thinking? We were eating breakfast in the quaint hotel restaurant. Not far from our table, I noticed a couple with a toddler enjoying breakfast, as well. Their son was sitting in a high chair, furnished by the hotel. He had on a cute little hat. But wait—there was something different. I’m sure I tried not to stare. The little boy’s arms were almost non-existant and misshapen hands protruded from near his shoulders. He seemed happy. I thought of the struggles that might be in his future. A sun room for dining was just past our table, with the doorway between our table and that of these caring parents. Another mom and dad came in from the sun room with their own toddler walking ahead of them, carrying a banana. Suddenly, the small child fell on the carpeted floor near the high chair. He started to cry from the fall. A most amazing thing happened next. The crying child looked up to see the handicapped boy with no arms. The crying ceased and he stood up, holding the banana out to the boy, offering him the only thing he had to give. With no arms to recieve it, the happy face beneath the hat simply began to babble, "BA NA NA NANA!" in a perfectly cheerful toddler voice. Immediately, my heart was touched by what had just happened. What had just happened? I pondered the last few moments. Did the crying child even notice the obvious differences between himself and the other boy? Was he feeling compassion for his limitations? Did he offer the banana as a token of the empathy he was feeling in order to bring some sort of cheer? What if that wasn’t the case at all? He had fallen down and reacted with tears. As he saw the child in the high chair, did he simply recognize that another tiny person like himself was nearby and, with perfect innocence and selfless love, desire to give up his prized banana to bring joy? Only God knows what was in his heart that morning. Either way, He had allowed me to witness a powerful lesson. Crying? Fallen down? If we can possibly stand, there still might be something that we have to offer that could speak love into another’s life. I heard someone on a radio broadcast speak today about relaxing and allowing God to handle things. He wasn’t really saying anything that I had not heard before, yet I began to consider what it would really be like to do it—to relax and trust God with things. Trust Him when things were stressful. Trust Him during difficult times. There are times when I think that God wants us to be concerned. We have the deep concerns of many who lived long ago recorded for us in Scripture. What is the difference? Going to God with the things that trouble us is different than fretting and pacing the floor. He is the only one who understands everything. 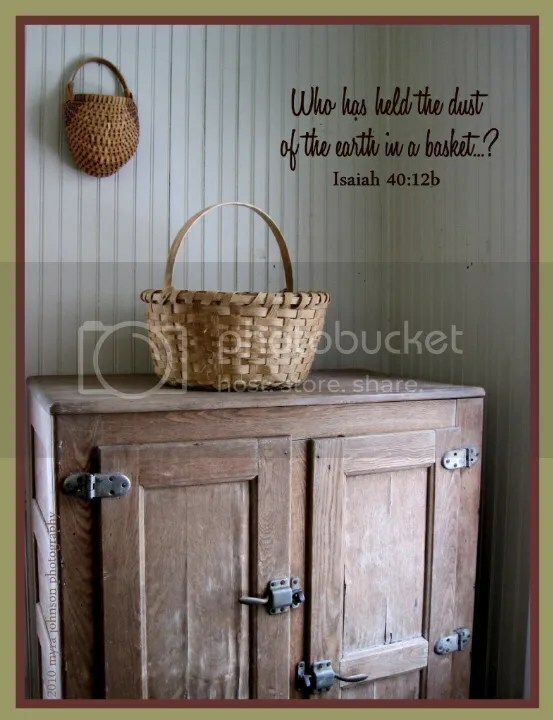 The Bible says in Isaiah 40:12b, "Who has held the dust of the earth in a basket, or weighed the mountains on the scales and the hills in a balance?" The answer is God. He’s holding everything together—including you and me. He did great and mighty things as He brought the children of Israel out of Egypt long ago. He fed them manna and brought them water out of hard rock. When food was not present, He created it. Food not known to man ever before. When drinking water was needed, He provided it from a rock in the desert. Only God can do miracles. When we are needy, we sometimes see only barren land and rocky cliffs. Faith allows us to see from a different perspective. 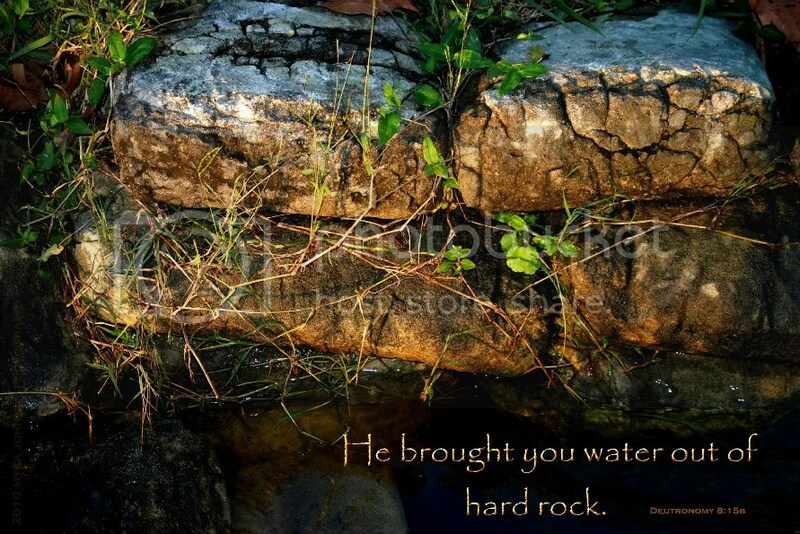 If God can bring water from a rock, what lack do you have that He cannot provide? The tall, gray crane was alone. This is unusual, because they mate for life. 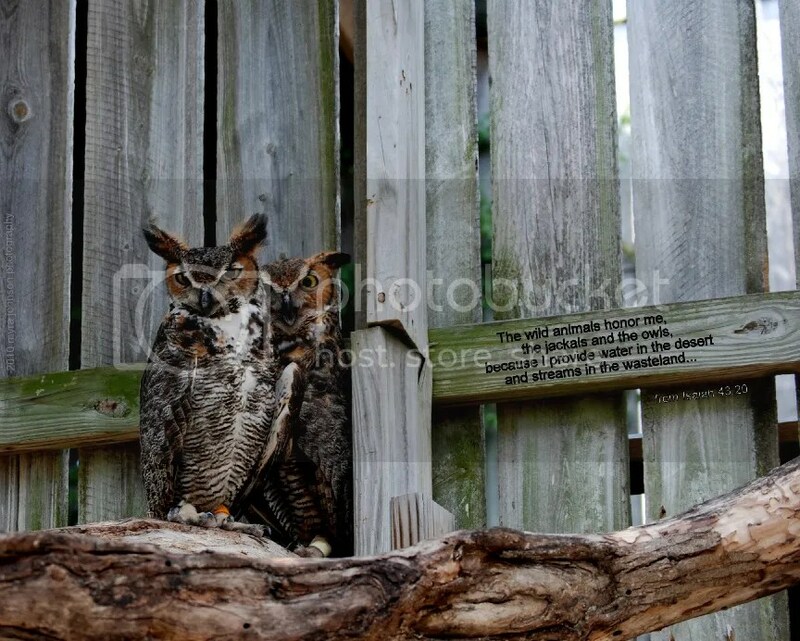 Normally, they are seen in pairs, perusing their surroundings at a leisurely pace. Beak to the ground, it was searching in a small grassy median of the parking lot. It was so close to my car! After taking a few photos from inside, I risked stepping outside for a closer look. For some reason, it didn’t mind. I snapped away as it calmly poked around in the soil. Looking for food seems to be a constant passtime for these creatures. It seems to pay off; they always appear to be well fed. But what if they never looked for food? What then? Certainly, they would have less. Do we look for the good in others? 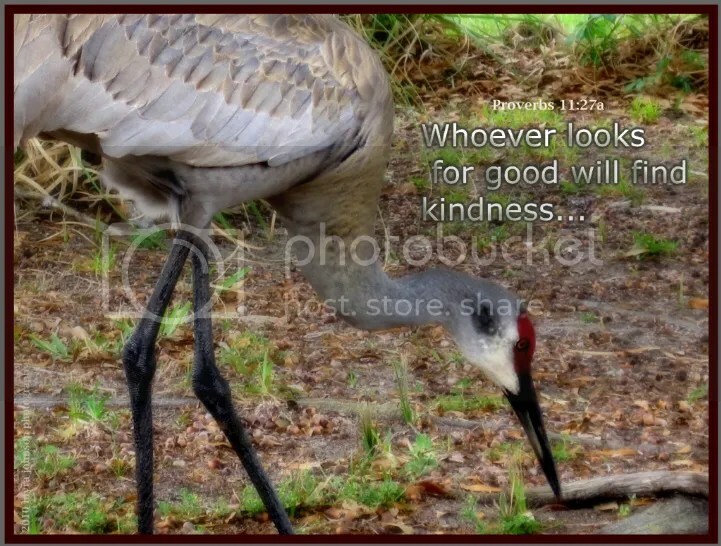 Do we find kindness as our "beaks" are pointed toward the unseen hearts of those we come in contact with? Let’s look for good and just see what we find…. My dear brothers and sisters, do not be fooled about this. Every good action and every perfect gift is from God. who does not change like their shifting shadows. This truth was extremely evident to me today. At work, a really important project is coming up. One that I am responsible for. I needed help for a particular presentation and I wasn’t sure where this help could come from. Early this morning, I prayed and asked God to help fill this position. Something else happened early this morning after I arrived. After checking several different avenues, I was coming up with no one to help with this situation. Once again, I prayed and asked God to take care of it. At the time, I had been working in an area a short walk from my office. As I began to walk back,suddenly another employee walked up to me. Before I could say anything, they simply began to tell me that if I needed any help at all for this major project, they would be available………. God supplying my need, right before my eyes. I didn’t recognize the book. This began a short conversation on what appeared to be a successful book on becoming good financial stewards. Skimming through the book and reading short passages, I came to the conclusion that one of the important premises presented was to encourage the reader to resist "keeping up with the Joneses" because the Joneses actually had no wealth to speak of. I personally feel that many people appear to be wealthy, yet they are in tremendous debt, live under umcomfortabe financial demands and truly are not very happy. I would probably be in agreement with the author. I am quite certain that I could do some wonderful things with more money. That has never really been my goal, however. What is actually most important? A nicer house? A newer car? A boat? Stylish clothes? We find a passage in the Bible that brings us to a different realm of blessing. It’s words resound with love. God will provide for His people. It was only eight words. 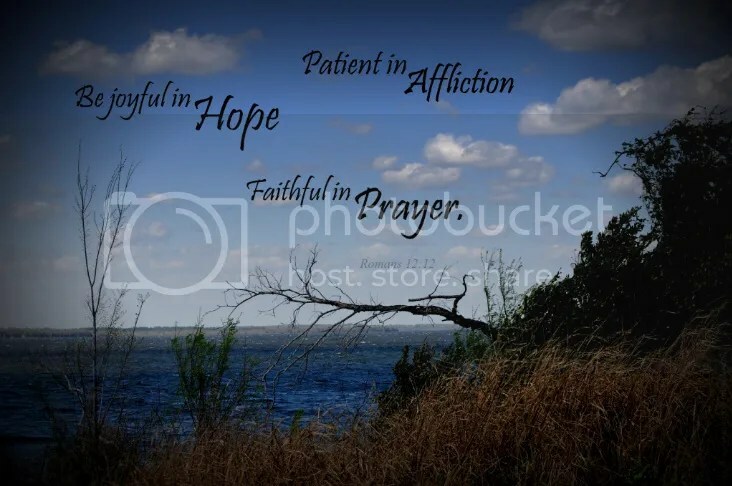 Eight words that caught my attention and landed with recognition on an all too-knowing heart. "A long conviction of worthlessness builds strong walls." I was watching as the actors portrayed the inward struggle of non-acceptance vs. worth common to everyone. More than likely, it is familiar to you, as well. Haven’t you heard it before, somewhere in the recesses of your mind, perhaps when things just weren’t going as you’d planned? "Why even try? You’re just a failure." "You’re not smart enough for that." "College is only for the rich." "God doesn’t really care about you; if He did…"
Once these deceptions have infiltrated your thinking, they "set up shop" and begin their daily tasks of condemnation. 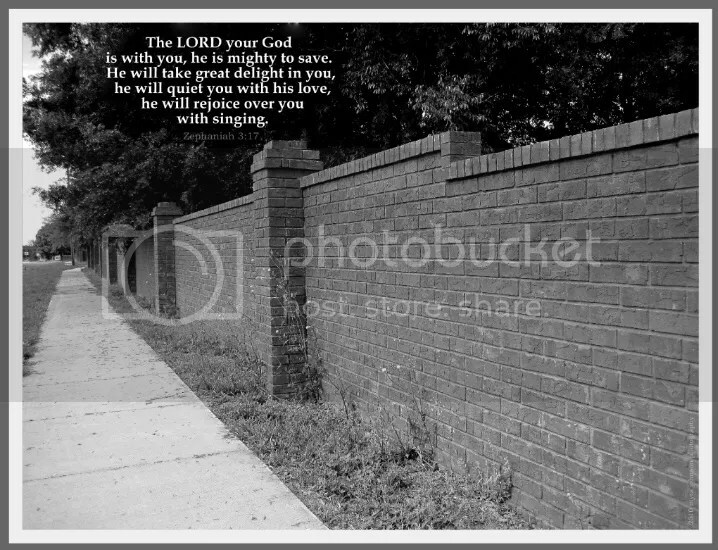 Soon, walls are erected between God’s truth and what you have come to believe. Worthlessness is the order of the day and feelings of positive self-worth are kept at a great distance. But what does the Bible say about who you really are and what you are worth? Long convictions of worthlessness may indeed build strong walls, yet mighty is our God who delights in His children; it is He who has the power to break them down. Traveling along the lakeside road, I noticed a tree leaning out over the pavement. I had passed this way many times before. The strong, tall tree which had been an ordinary green in my memory, had transformed into a strikingly gorgeous burst of purple blossoms. 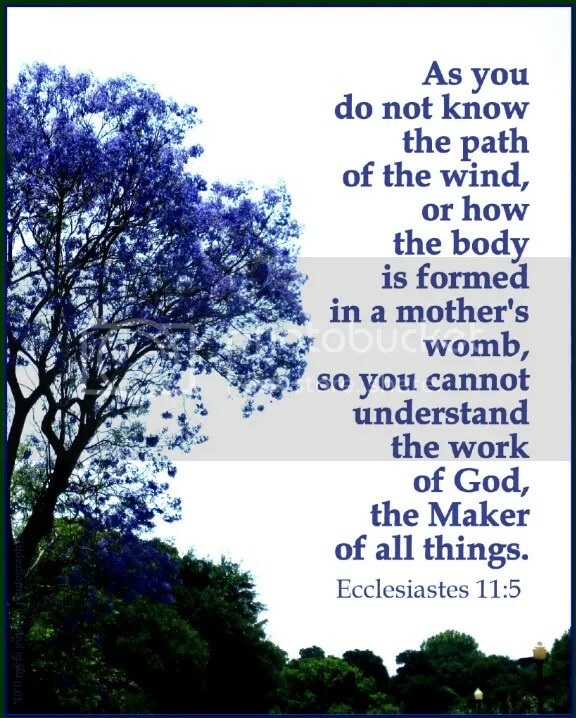 God knew all along that when the tree was mature, it would produce lovely hues of lavender and indigo blue. God was at work in the tree, without my awareness. The wind blows, the tide rises and falls, a new baby is born. A tree blooms, the sun sets, a year passes. yet I put my trust in the Maker of all things. Eighty million gallons of water. Every day. That’s how much water flows from a natural spring only a thirty minute drive from my home. The source of the spring is visually captivating. The surface of the water above the flowing underground opening appears a tourquoise green. Sparkling and clear, it is lovely to behold. A wide variety of wildlife make their home near the spring. It’s fresh water invites and sustains both the plants and the animals. It is a source of life, teeming from the deep caverns below. If I were to visit the spring tomorrow, it would be as it has always been—fresh water, not salt water. God has determined it to be so. The oceans are filled with salt water, yet they remain within their boundaries. 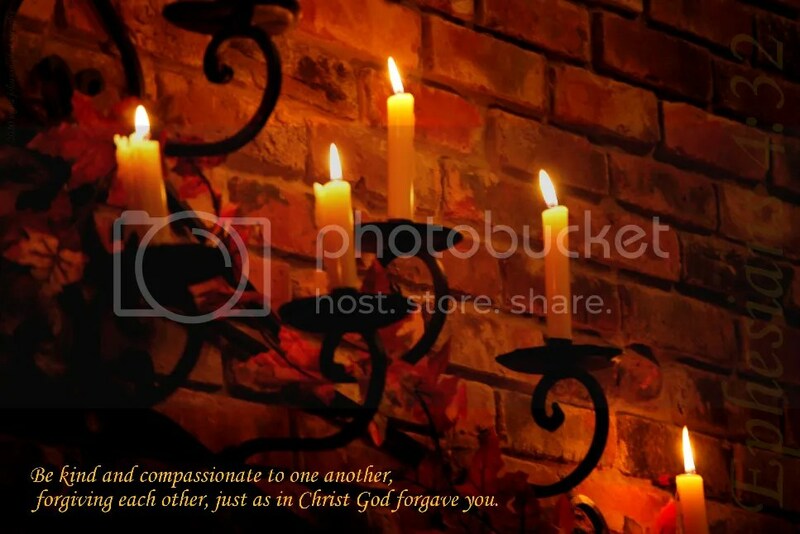 As Christians, should we be the same each day? Should the words from our mouths always be consistant with our testimony as those who are living in the faith of Jesus? Out of the same mouth come praise and cursing. My brothers, this should not be. Can both fresh water and salt water flow from the same spring? Do you know any songs that were written to encourage the listeners? One such song is very popular on the radio now. That you still have a reason to sing? It’s just the dark before the morning. But you’ll see the bigger picture. The bigger picture. So many times, I am confused by my up-close and personal view of the "now" events that create my daily living. "Why can’t things be different?" "I’m praying, but I don’t see any change." As I look back, however, I do see how God has been at work in my life and the lives of those around me. What once concerned me and left me bewildered has become ordered and understandable now, because God has revealed to me more of the completed plan. 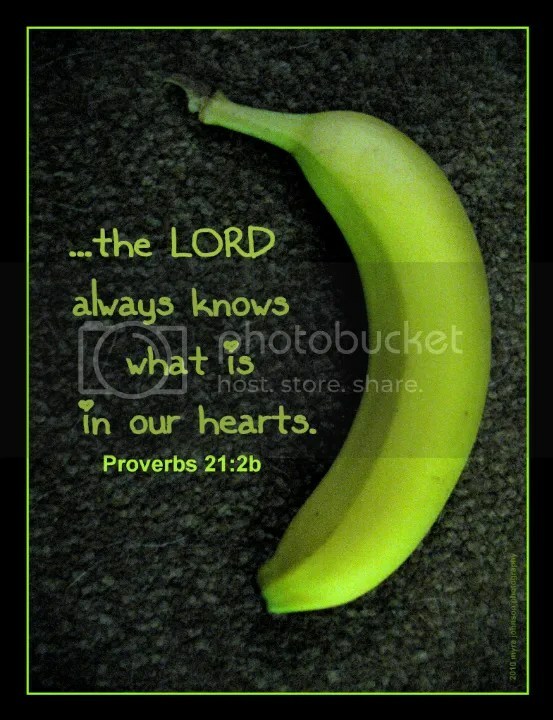 God knows what is best for us to know and when it is best to know it. When our faces are pressed toward the easel and life seems to be centered around senseless strokes of paint, we must trust Him, knowing that he sees the canvas from a sovereign distance. What if a bird just didn’t want to fly? Do you ever wonder if they’re scared when they are first learning to leave the confines of the ground beneath them? What might go through their minds the first time they soar up really high? They can’t get off the roller coaster. They can’t step back down the ladder. All they have is their own two wings to get them back on familiar land. If a bird could fly but simply wouldn’t, it would seem sad. Think of what they’d be missing! All of those aerial views of valleys and mountains, growing crops and winding rivers. They could see and know like no other creature, but they just didn’t want to fly. I recently photographed a bird on his wet-sand runway, readying for take off, with webbed feet pushing his little body forward. If a bird chooses to fly, he must first spread his wings in anticipation of the very first "flap." He simply has to try. God gives us gifts, too, even though flying with wings is not one of them. Wouldn’t it be a shame if God granted us a gift, yet we never used it at all? Think of what we’d miss! Just because of fear or uncertainty or the convincing words of discouragement whispered in our ears, many of us choose to keep our wings placed closely to our sides, choosing only to walk about like wingless creations. Whatever spiritual gift God has granted you, He has given it to you for a reason. Why not use this gift to further His kingdom? To help bring healing to broken hearts? Think about it———–don’t you really want to…fly? Don’t let anyone look down on you because you are young, but set an example for the believers in speech, in life, in love, in faith and in purity. Until I come, devote yourself to the public reading of Scripture, to preaching and to teaching. 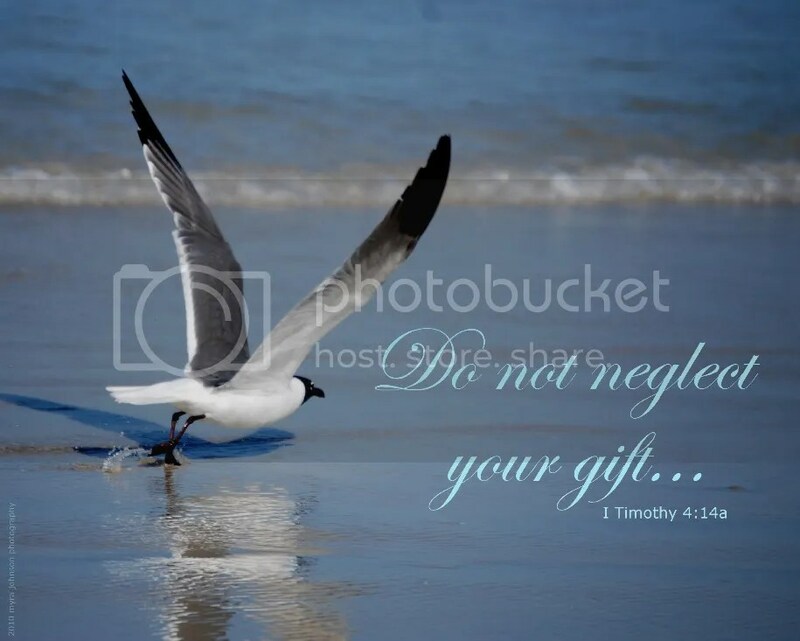 Do not neglect your gift, which was given you through a prophetic message when the body of elders laid their hands on you. Is what I say wholesome? Do my words build others up? Does what I say benefit those who listen? Do I grieve the Holy Spirit? Am I bitter and angry? The sun was just coming up, lighting the dawn sky as the flag unfurled in the wind. Piercing the velvet canopy with an orange-cream horizontal plume, a solitary jet in the distance created a stunning scene that lasted only for moments. 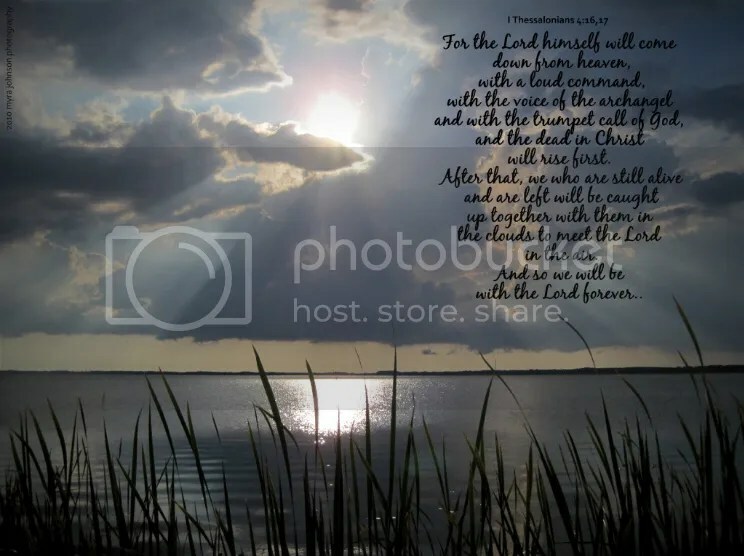 The world and all its nations belong to the Lord. Technology sufficient to place a plane onto the horizon comes from the collective knowledge that He grants us. 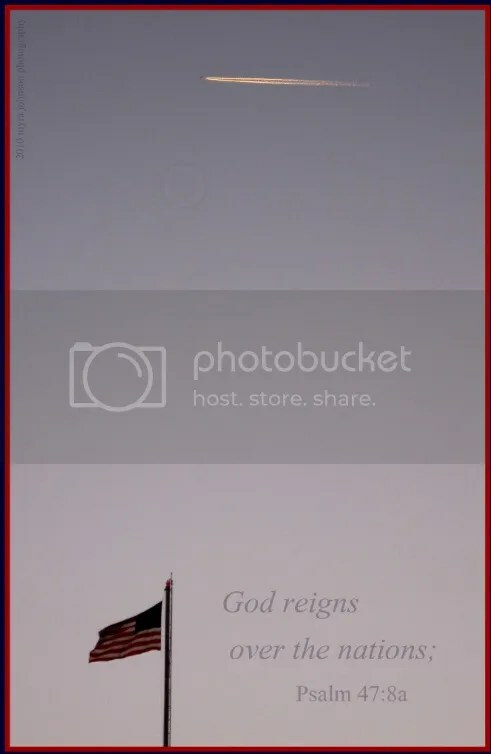 It is God who reigns. Springtime seemed late in its arrival this year. Cold winds and frost were unpopular guests not long ago. Finally, spring has arrived with blooms and blossoms filling the air with sweet, wafty fragrances. The bushes that line our garage are filled with white flowers. The red rose bush is blooming, the yellow orchid is unfurling and even the pink mums are emerging. New life abounds. Renewal is modeled for us in so many ways. The barren tree becomes green again, with thick, lush leaves. The brittle branches of the empty bush fill with promising buds. Isn’t it possible for us, as well? Can’t God take us when our lives are no more than barren limbs and brown, fallen leaves and renew us—transform us—into something new again? If God can renew the earth, can He not also renew His people? It was such an inviting scene. My husband and I pulled our car to the side of the road just to look at an area I had spotted.The fallen leaves on the path were in contrast to the tree branches hanging overhead. In one of the sturdier limbs, a squirrel gave a continuous monologue that kept me fascinated for several minutes. We did not go down the road very far. We were unsure as to where it would lead. Instead, we turned back. 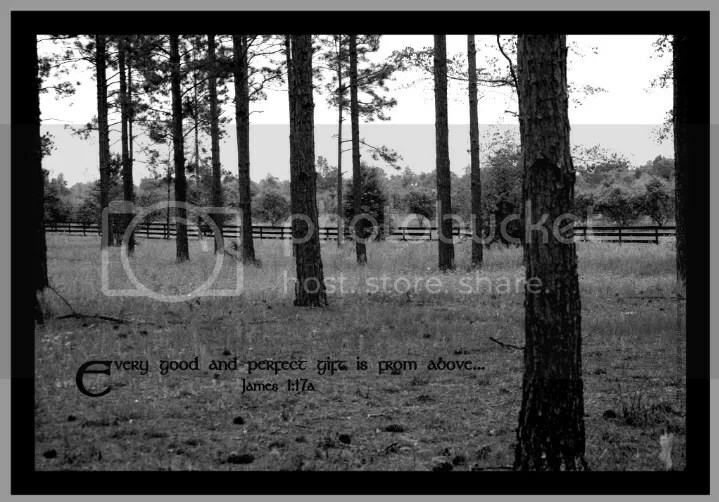 More than likely, it was private property not meant for public passage. God’s path for our redemption into His kingdom is not poorly marked. Those who choose it do so understanding His great love and forgiveness. He has made known to us which path to take. 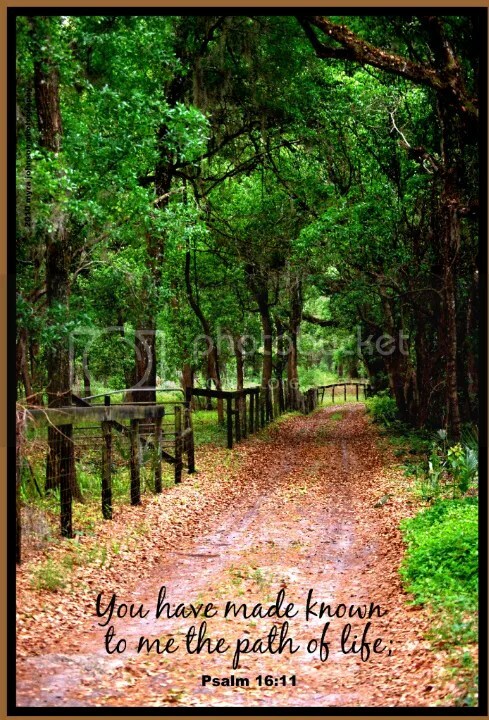 The road that leads to God is the only path that leads to life. At this time of year, colorful tree frogs occasionally adorn the exterior of our home at night. Fascinating creatures. Deep eyes that look like finely crafted glass marbles. Remarkable toes that grip with such strength. Legs that catapult them high in the air. Not long before bedtime, I noticed a tree frog on the outside glass of our front door. In my pajamas, I decided to step outside for just a photo or two of my visiting friend. On the way out, my eyes were drawn to the sheetrock wall of the indoor entryway of our home. There, as if plastered to the surface, was another tree frog. The inside of the house had looked inviting—so here he was. And here he would die, if I didn’t catch him and set him free outside. It wouldn’t be long before the lack of moisture would take his life. I tried to contain him in my hands. I was planning a rescue; he was intent on the chase…. Boing…boing…… If he hopped too many times, I might lose him behind furniture and his chances of survival would grow slim. God must have allowed me to save him and set him free. With my sudden adventure over, my attention was given once again to the frog on the door. Only a clear, hard substance we call glass separated this frog from the death that had been awaiting his unsuspecting brother. One frog was intent to go farther inside, moving away from that which could save him. He simply didn’t understand that he was headed in the wrong direction. Aren’t we like that? Without God, we think we know what looks good. The lights are bright; the air is cool. What harm could there be in just hopping in for awhile? A few minutes, a year, a lifetime. When God pursues us, offering life and redemption from the poor choices we’ve made, what do we often do? We head deeper into the foolishness of independant thinking and the will to do things "our way." Through God’s mercy, many are brought back from behind the glass and released into life. I was once behind the glass. Last night, I heard someone reference a card game while speaking about a relationship with God. I suppose there could be several inferences noted by the statement that was spoken. The analogy was a simple one: where God is concerned, are all your "chips" in? Looking at this example from one vantage point, it could be said that in our journey of faith the chips are everything in our lives. 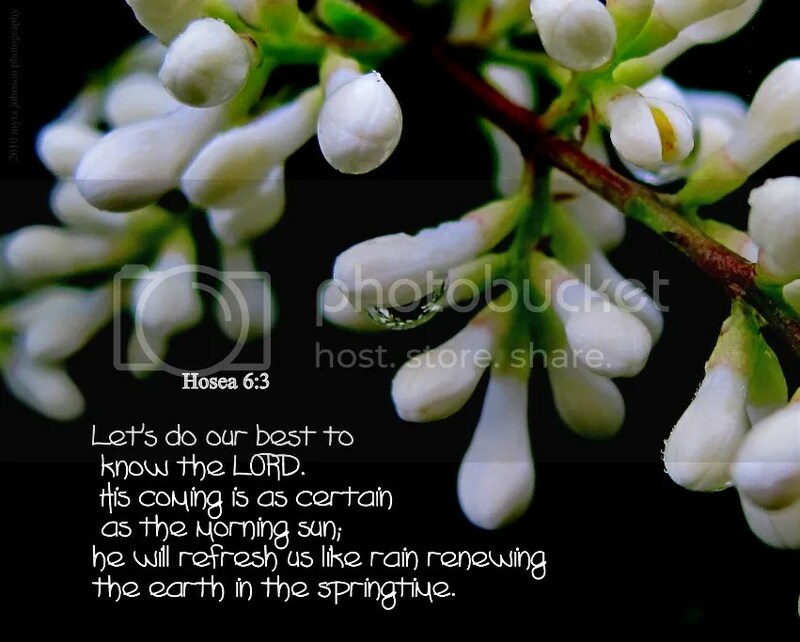 Are we giving everything to God? Holding back nothing? Those are not easy questions to ponder. Couldn’t we keep back just one chip? Do we have to inquire with God about everything, or could we reserve that specific area to be free of God’s guidance in the matter? Thinking of the card game once again, there is a second thought. As a player looks at the cards he is dealt, there are times when what is seen is disappointing. "I can’t do anything. There’s not much worth to me. 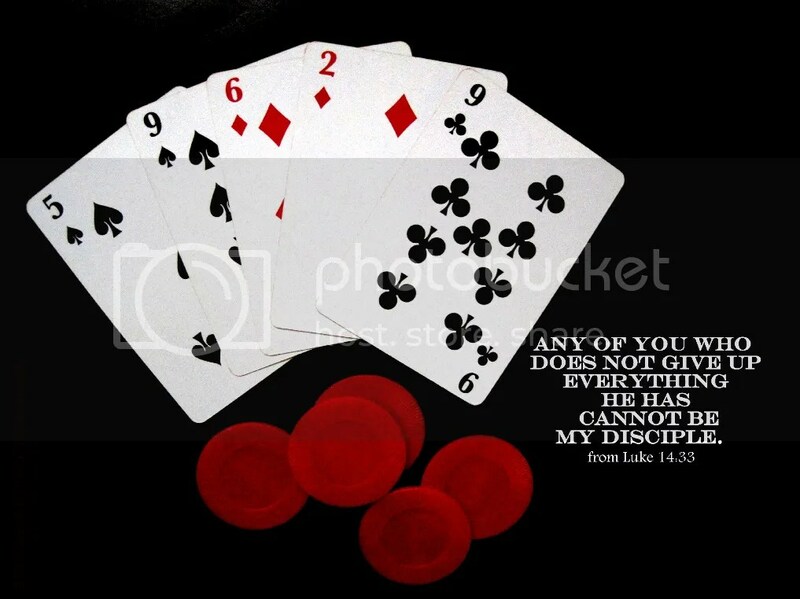 The hand I’ve been dealt is no good." Well, then, if that were the case, could God not use whatever you have to offer for His glory? From either angle, questions remain. Are we willing to trust God with everything? I think there were at least three of them in the sky. Coming along the shore several yards out were very brave individuals enjoying the sport of kite boarding. If you’ve not seen this type of thing before, allow me to desribe it to you. A small surf-board/wake board is connected to a large kite that resembles a parachute. As the kite is lifted higher into the wind, the board is compelled to join it. If you happen to be connected to the board in some way, you, too will be soaring above the water. One of the kites came relatively close to where I stood. The surfer hung on as he was pulled from the water into the air above him. It was a "wow" moment for me as I photographed him. It was most likely a very big "wow" moment for him, rising to where the wind would take him. Why do we, as humans, want to fly? Why do we want to climb trees? Scale mountains? Why do we strap ourselves to fiberglass boards connected to kites? Do we yearn to see more, learn more, understand more? Look at things in a way we’ve not been able to before? Was David asking God to allow him to come closer in relationship? To leave the confines of the valley to find the rock higher than himself? 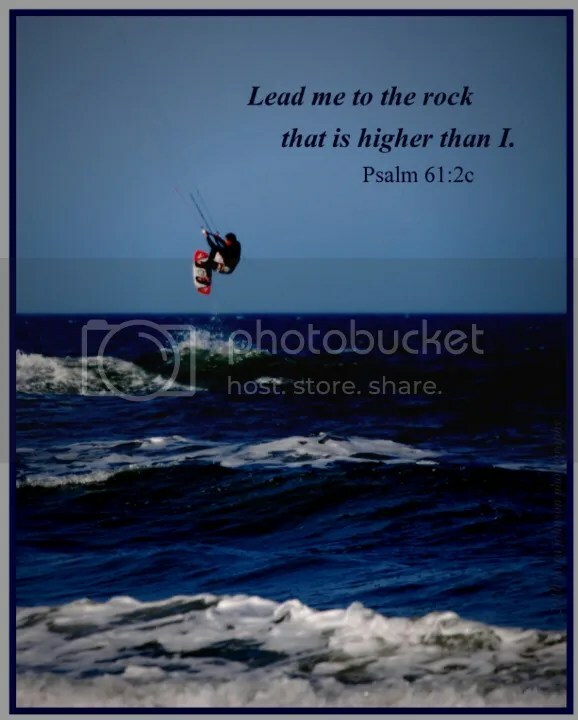 Could it be that in order to grow closer to God, we have to hang on to the cords that He has provided as our feet are lifted high above the waves of what has become "normal" in our lives? It was a captivating spring day. The seasonal winds were strong enough to keep would-be boaters out of the water, while sending crashing waves on shore with rhythmical fury. To stand there and take it all in—the birds soaring above me in firm, but gentle competition with the incessant breeze, the bubbling foam riding in on the surface of every swell—those moments were a gift from God to me. The nearby foliage was a mix of new life emerging around empty branches and brown, faded grass. 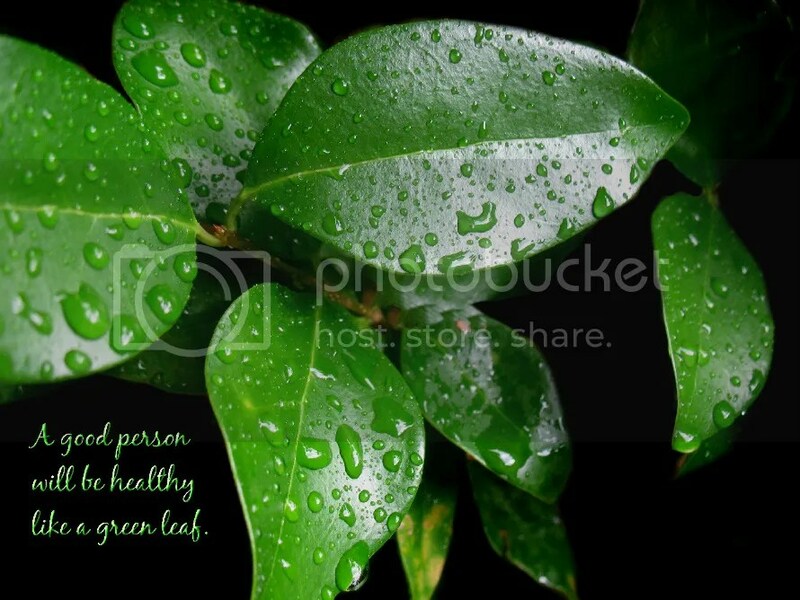 The presence of green leaves gives credence to the hope of the coming summer months each year. In my own life, I can find dead and brittle branches–tan, lifeless stalks of the past. What was once called "now" has been replaced with "yesterday." I can also find the green buds of new growth heralding the hopes of "today" into what I must trust in God’s hands for "tomorrow." In the hope that comes from Him, I am to be joyful. So what do you see when you look at me? That would have been a perfectly understandable response to the words I heard this morning. 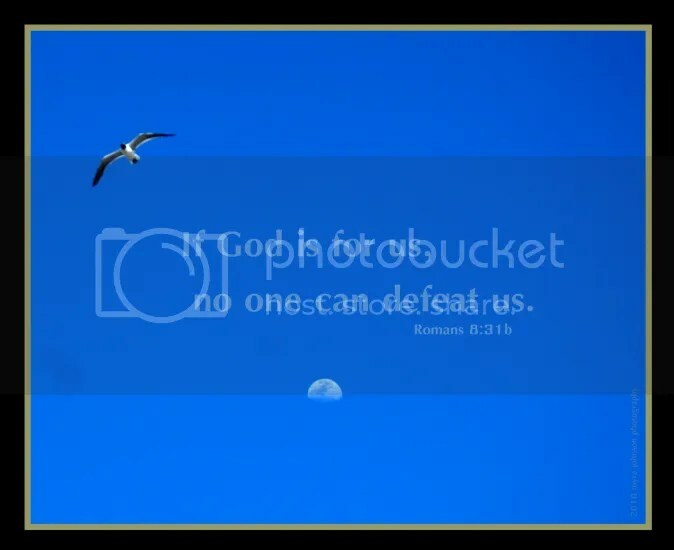 The speaker put the words to 1 Corinthians 13:4-7 on a screen. He left blanks every time the word "love" was used, except for the last time. The audience was instructed to read it, putting their own names in the blank. 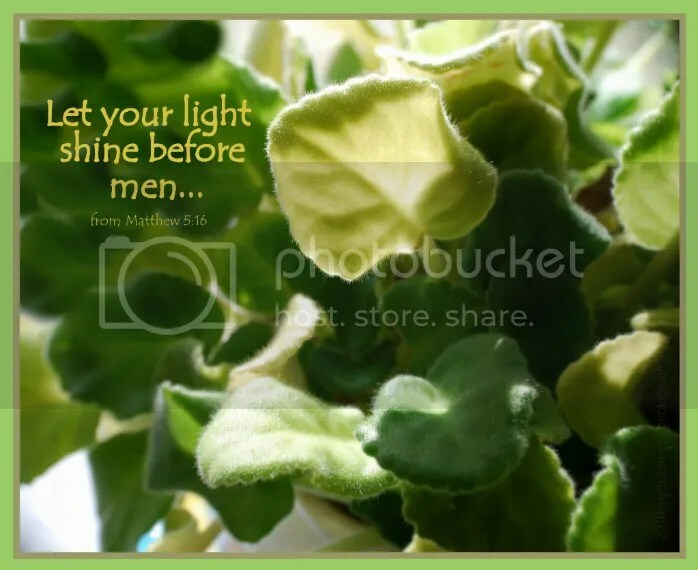 As believers of Christ, we are the light of the world. What does that light look like? Does the light shine, showing us to be transparent? Showing us to be who we really are, all the way through? This doesn’t mean that we are perfect, inside and out. The light we shine does not come from our perfection. Rather, it comes from a relationship with God that allows us to show patience, kindness, love and understanding to others. He guides us in the process of being the living lamps of the world.